Jerry Norton, pro DB/HB, played at SMU from 1950-54. He then went pro for the Philadelphia Eagles from '54-58, Chicago Cardinals in '59, the St. Louis Cardinals from '60-'61, the Dallas Cowboys in '62 and the Green Bay Packers from '63-64 where he closed out his pro career. What's the address of that store in Colleyville, mavsrage? Directions from Dallas to get there? He is not the author of a book called "Mom, Can I Play Football?" That's another Jerry Norton. Here's Norton's 1963 trading card. It's a gaff, though...it says 'Dallas Cowboys' but he's wearing a Philadelphia Eagles uniform! Most fans worth their salt are aware of the controversies surrounding the various halls of fame, primarily at the professional level. Baseballâ€™s Pete Rose is not in and may never be. Footballâ€™s Lawrence Taylor is in and maybe shouldnâ€™t be. There are arguments for both sides of the issue in either case. There is no question that both athletesâ€™ accomplishments on the field of play merit hall of fame inclusion. The controversy lies within their off-field activities. The difference may well lie with the morals of those in charge of the ballots for each sport. Jerry Norton will likely never be enshrined in the Pro Football Hall of Fame in Canton, Ohio, although he may be more qualified than some of the honorees. In 11 seasons with four NFL franchises in five cities, the former Texas High standout had 35 career interceptions, averaging 16.8 yards a return. Heâ€™s also the only player in NFL history to twice intercept four passes in a game, both coming as a member of the St. Louis Cardinals in 1960 and 1961. In addition, he averaged 7.3 yards a carry in an abbreviated offensive pro career, and averaged 43.8 yards on 358 career punts in the NFL. But this is not about Norton being shunned by the pro football voters. This question is aimed at the 24 people who are annually charged with electing members to the Texas High School Football Hall of Fame. If ever a man deserved to be included in a high school football hall of fame, itâ€™s Jerry Norton, who played football and basketball under Watty Myers, lettering three years from 1947-49. But he didnâ€™t just earn a letter, he was all-state in both sports as a running back/defensive back. His senior year he was selected to play in both high school all-star games, but chose basketball because its application arrived first. He was the most valuable player in the all-star game. 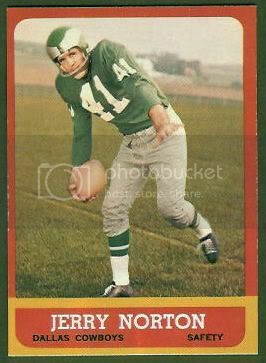 Maybe had he played in the football all-star game, Nortonâ€™s lot may have been different as far as the THSF Hall of Fame is concerned. Yet he might still have gone unnoticed by the eight sports writers, eight coaches and eight hall of fame members who vote each year on the nominees if a group of former teammates and pals from his SMU playing days hadnâ€™t intervened. Norton, who is retired from the electrical supply business in Dallas, also played baseball one year at Texas High and participated in track and field in the high jump, long jump and hurdles. He would also participate in the two field events for SMU. But football and basketball were his main sports activities. The SMU group, which includes Nortonâ€™s former Texas High teammate Jerry Clem, is pushing hard to have him elected in 2007. The committee also includes SMU All-American Val Joe Walker, Don McIlhenny, another SMU teammate and NFL player, and Don Martin. Clem, who played with North from the junior high level through college at SMU before choosing dental school over the NFL (Like Norton, he was drafted by the Eagles), knew Nortonâ€™s talents probably more than anyone. â€œJerry was a true triple-threat back,â€ Clem said. â€œWe didnâ€™t utilize him right at SMU, but if we had spread the field I think Jerry would have been as big a threat as Vince Young was at Texas last season. Norton has other backers in former Dallas Morning News sports writer Sam Blair and SMU and Dallas Cowboys great Don Meredith, who reportedly has agreed to write a letter of recommendation to the Hall of Fame committee on behalf of Norton. The fear the Norton committee has is the voters may be too young to remember Norton, and may overlook his accomplishments at Texas High. Still, his chances should be good. The Hall of Fame committee annually selects a player from each decade, dating back to the pre-1940s through the 1990s. They also add one coach from that time span. Among those selected for 2006 induction are Bobby Joe Conrad, Louie Kelcher, Walter Abercrombie, Todd Dodge and Byron Hanspard and former Temple High School coach Bob McQueen. There are even a couple of guys Iâ€™ve never heard ofâ€”Francis Pulattie of Waco High School, and John Kelley of Mineola High School. Pulattie was the pre-1940s selection, and Kelley was picked over Norton, who was on the ballot, from the 1940s. Norton could be the next inductee from the 1940s, but if heâ€™s excited about the possibility he doesnâ€™t show it. â€œAll that stuff was so long ago,â€ he said. â€œI guess my kids would enjoy it if I got in. Odds are he will get in with all the folks he has working in his behalf. There are some pretty big names in his corner, and they are bound to get the selection committeeâ€™s attention. But it never should have come to this. Jerry Nortonâ€™s merits speak for themselves. Heâ€™s been a star in football at three levels, but he doesnâ€™t need his college and pro credentials considered for his election to the THS Football Hall of Fame. He deserves a spot in the Waco-based Hall based on what he did at Texas High. And his inclusion is long overdue.